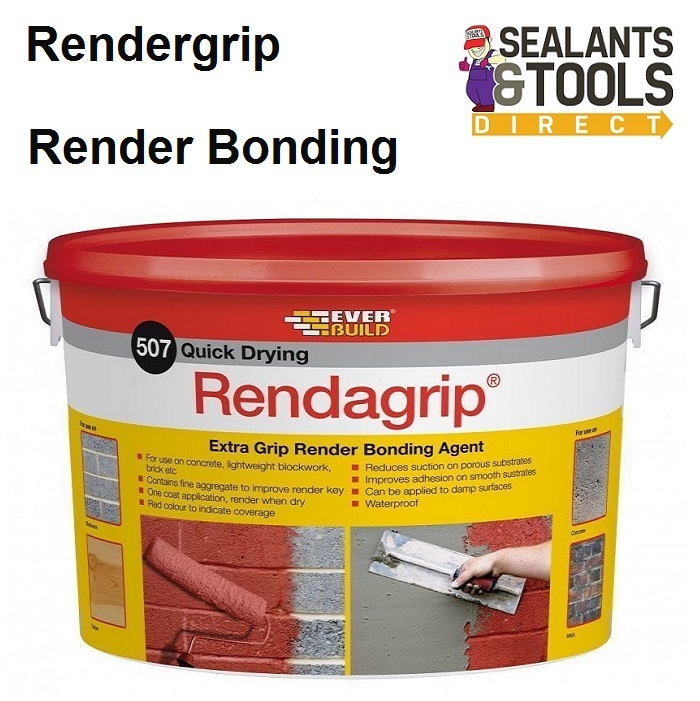 Everbuild 507 Rendagrip is an extra grip render Coating bonding agent that contains a fine aggregate to provide an improved key before applying render on external surfaces e.g. concrete, lightweight blockwork, brick etc. The fine aggregates are suspended in a unique waterproof polymer to ensure easy application by roller or brush and an even spread of aggregate avoiding any weak spots in the key coat and preventing the aggregate particles coming loose during application. Everbuild 507 Rendagrip reduces the porosity ie suction of the base substrate and provides a mechanical key from the fine aggregate suspended within the product. As a bonding agent for render to concrete, brickwork, blockwork etc. As a bonding agent to improve adhesion to smooth surfaces. Ensure ambient temperature is above 5°C. Ensure substrate is dust, release agent and frost free and is suitable to provide sufficient support. Apply using a short pile roller or brush to give an even coating. 507 Rendagrip is coloured red to help avoid missing any areas. Protect adjacent surfaces from splashes and remove any 507 Rendagrip before drying with warm soapy water. Allow to dry thoroughly before applying render "usually 6 hours minimum". NOTE: drying time will be significantly extended at low temperatures. Approximately 3.0m2 per litre depending on porosity of substrate. "Take a look at the Official Datasheets from Everbuild"